CAS-ual Fridays, the Clean And Simple Challenge! CAS-ual Fridays Stamps, the new little sister. that ended yesterday with the announcement of the winners of all the sets! Today marks the Grand Opening of the store! That's right! The stamps are available on our new website NOW! gift certificate to this week's challenge winner!! CAS-ual Fridays will remain open to all players to use ANY products you have in your stash. but the challenge will remain an open source of inspiration to ignite your creative mojo. 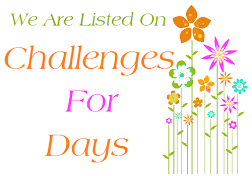 You are welcome to use ANY products to create your challenge projects. This is a very bittersweet week for me. The Girl Fridays are all very special to me. but what you really need to know is that they are all genuinely nice people. They are truly some of my favorite people! So, saying farewell to a few of them this week is definitely not on my list of things that make me happy. This lady has been with me since the very beginning. She too, has been with me since the beginning. They just don't come any nicer than Jenny. I'm sure you all will miss her sweet comments. This girl is the best, and is at the beginning of a very bright future. Let the inspiration parade featuring CAS-ual Fridays Stamps begin!! This was BETTER than the ROSE BOWL Parade! Thanks for the great challenge this week! Congratulations for new shop! Lovely inspiration from DT. What wonderful samples with your new sets! What beautiful samples! So inspiring! Terrific challenge! Thanks for the wonderful inspiration. I like Gayatri's card the best. Those Glossy Accent dots -- that must have taken forever! Thanks for another fun challenge, and you ladies have inspired so many with your gorgeous kraft creations! Well done! Lots of fabulous kraft inspiration this week, thanks so much ladies! Love the krafty inspiration and I can't wait for my CF stamps! Gorgeous submissions by the DTs. I just uploaded my card. Love Kraft. WTF, I missed it and I had a card in mind, too. I think you should have extended this week by a day because of Halloween. You can make eight-day weeks, right, Michele? Still, lots of wonderful inspiration from the DTs and the "contestants" for me to pin or bookmark, so it's all good!